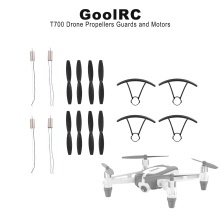 These spare parts are suitable for your GoolRC T700 RC drone. Including 8 black blades, 4 propeller guards and 4 motors (ccw&cw). Spare Parts: 8 black blades, 4 propeller guards and 4 motors (ccw/cw). Suit for your GoolRC T700 RC quadcopter. Best replacement of your old one. Any problem, please contact our store without hesitation. Honor to serve you.